Living in a cemetery gives me the opportunity to observe a nice diversity of lichens. I went out this evening to see some of this diversity; my camera served in stead of a hand lens. 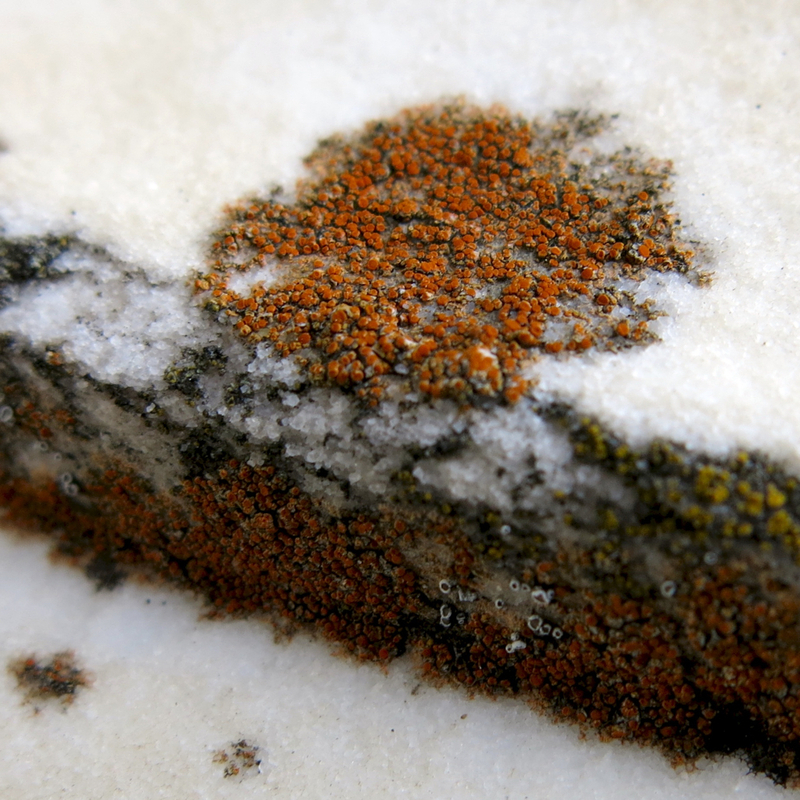 This crustose lichen, covering an area about the size of a quarter, was growing on a marble gravestone. The magnification of the photo shows how the lichen has etched an indentation into the stone. To make an accurate identification of crustose lichens, I’d need both a microscope and far more knowledge than I currently have. But this may be in the genus Caloplaca: “The 25 to 30 species [of Caloplaca] reported from California … occur very widely on trees and mostly calcareous rocks. Caloplaca saxicola is common and one of the first crustose lichens collected by beginners” (Mason E. Hale Jr. and Mariette Cole, Lichens of California [Berkeley: Univ. of Calif. Press, 1988], p. 190). 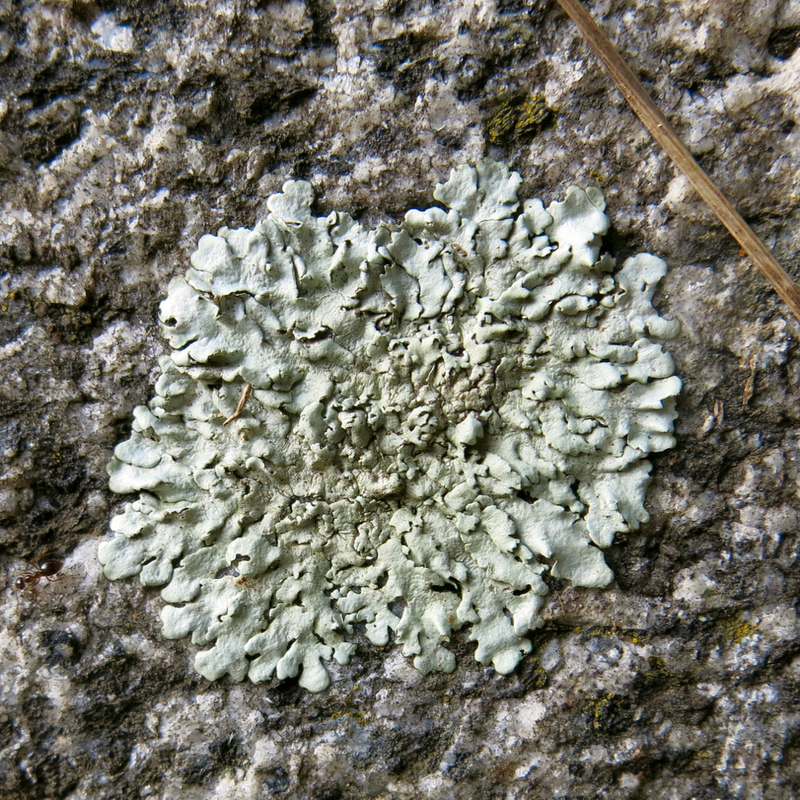 If I were to get serious about identifying lichens, I’d need to go out and get the K, C, and P reagents, an inexpensive USB microscope, and a few other things. Then I’d have to get serious about studying them: dissecting them, looking at them under the microscope, etc. Is it enough to just look at lichens without identifying them? or do I want to engage in more serious study of them? Heraclitus advised that “those who are lovers of wisdom must be inquirers into many things indeed” (DK35); but how deeply should one inquire into each of those many things? One only has so much time in this world; a serious in-depth study of one topic means less time to inquire into the many other things.